Book of Hours in Dutch, Foliate initial H (Here in dynre) with beast-legged bishop in margin, Walters Manuscript W.192, fol. 105r, originally uploaded by Walters Art Museum Illuminated Manuscripts. This Book of Hours was created in the Netherlands in the fifteenth century. Written entirely in Dutch, its calendar is for the Use of Utrecht. 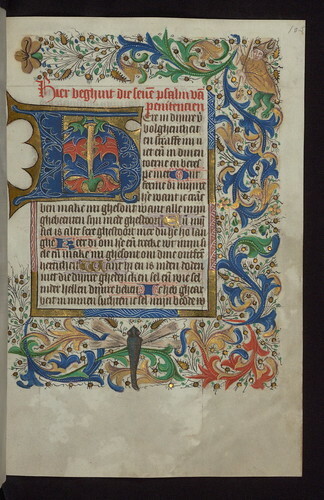 However, it was probably made in Haarlem, which produced books of hours with this kind of border decoration. Its folios are highly finished, and it is richly illuminated throughout with sprouting foliage, occasionally inhabited by people, animals, and grotesques. Large decorative initials mark the main divisions in the text, the first of which is historiated with an image of the Virgin and Child. Especially notable is the fine quality and abundance of its burnished gold, found in the initials and vegetation on nearly every page of the manuscript.